2That I have bitter grief and incessant anguish in my heart. 5To them belong the patriarchs, and as far as His natural descent was concerned, from them is the Christ, Who is exalted and supreme over all, God, blessed forever! Amen (so let it be). 4For Christ is the end of the Law [the limit at which it ceases to be, for the Law leads up to Him Who is the fulfillment of its types, and in Him the purpose which it was designed to accomplish is fulfilled. That is, the purpose of the Law is fulfilled in Him] as the means of righteousness (right relationship to God) for everyone who trusts in and adheres to and relies on Him. 3Lord, they have killed Your prophets; they have demolished Your altars, and I alone am left, and they seek my life. 5So too at the present time there is a remnant (a small believing minority), selected (chosen) by grace (by God's unmerited favor and graciousness). 6But if it is by grace (His unmerited favor and graciousness), it is no longer conditioned on works or anything men have done. Otherwise, grace would no longer be grace [it would be meaningless]. 11So I ask, Have they stumbled so as to fall [to their utter spiritual ruin, irretrievably]? By no means! But through their false step and transgression salvation [has come] to the Gentiles, so as to arouse Israel [to see and feel what they forfeited] and so to make them jealous. 12Now if their stumbling (their lapse, their transgression) has so enriched the world [at large], and if [Israel's] failure means such riches for the Gentiles, think what an enrichment and greater advantage will follow their full reinstatement! 15For if their rejection and exclusion from the benefits of salvation were [overruled] for the reconciliation of a world to God, what will their acceptance and admission mean? [It will be nothing short of] life from the dead! 32And they said to one another, Were not our hearts greatly moved and burning within us while He was talking with us on the road and as He opened and explained to us [the sense of] the Scriptures? 26And so all Israel shall be saved: as it is written, There shall come out of Sion the Deliverer, and shall turn away ungodliness from Jacob:27For this is my covenant unto them, when I shall take away their sins.28As concerning the gospel, they are enemies for your sakes: but as touching the election, they are beloved for the father's sakes.29For the gifts and calling of God are without repentance. Many misinterpret the NT because they fail to grasp the figures of speech (the metaphors) that Paul uses. This has caused millions of Christians to disbelieve God's promises to Israel. Let's take Gal. 3:7 for example: "Know ye therefore that they which are of faith, the same are the children of Abraham." The way most people understand this verse is: anyone who believes—Jew or Greek—becomes a spiritual son of Abraham. And everybody knows that a spiritual son is better than a literal one. Since this is so, then God doesn’t have to fulfill His literal promises to literal Israel, seeing as how He’s now got spiritual sons of Abraham, that is, spiritual Israelites. 38Art not thou that Egyptian, which before these days madest an uproar, and leddest out into the wilderness four thousand men that were murderers?39But Paul said, I am a man which am a Jew (Hebrew) of Tarsus, a city in Cilicia, a citizen of no mean city: and, I beseech thee, suffer me to speak unto the people. Is he under the vail for saying that? 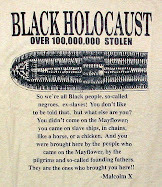 Some mistaken the proclamation of this Israelite truth as an issue of race or color. To those who hold this view, I respond with the following statement: I'm not concerned about a color or the unscientific notion of "race" but a nation. 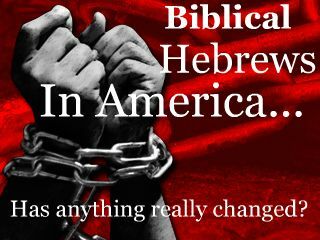 I think I've proven from the Scripture that the Most High is not done with this nation...and we already know that those people over there in "Israel" are not of this nation. But I believe that Christ (yes, I call Him Christ, which means "The Anointed One") is going to establish his kingdom through this nation (the OT Israel) and it will be headquartered in Jerusalem as prophesied by the prophet Zechariah. 8And it shall be in that day, that living waters shall go out from Jerusalem; half of them toward the former sea, and half of them toward the hinder sea: in summer and in winter shall it be. 9And the LORD shall be king over all the earth: in that day shall there be one LORD, and his name one. And though that's true the other verses concerning the tribes of Israel are equally true. This is my position on the matter. I have suffered much because of it. But nevertheless, I will stand by it until the Lord determines otherwise. 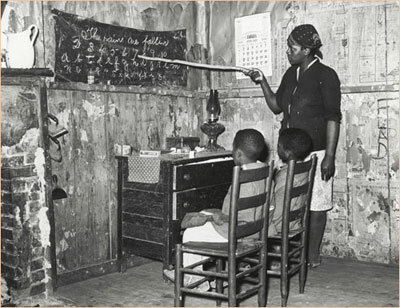 Photo: Israelite sharecropper educates her children at home; discrimination, poverty, and the waxing and waning of the planting season often kept southern Hebrew children from attending school. The Biblical "Israel" is a Who, Not a "Where"